Not another white cake. No, it is Lady Baltimore Cake. Two 9-in or 8-in cake pans or one 12-in round or square. Butter and flour cake pans like in Fraisier cake posted last month. Place butter and sugar in a large standing mixer and beat ant medium speed until light and fluffy. Turn the speed to low. Add the flour mixture and the milk mixture to the sugar and butter mixture alternately. Start and end with flour, beat until smooth after each addition. In another clean mixing bowl (you may have to transfer the batter to a large bowl, wash and dry the bowl), using a clean whisk attachment, beat the egg white until soft peaks form. Use large rubber spatula, fold whipped egg whites into batter. Stop as soon as the mixture is incorporated. Pour batter into prepared pans. Bake 25 minutes for 8-in pans, and 30-40 minutes for 12-in pan. The top of the cake will be browned nicely and a toothpick inserted in the center comes out lean. Cool in the cake pan for 5 minutes, then invert them on cake racks. Cool completely. Frosting and filling: the classic recipe use this 7 minute frosting. It is super sweet, silky and gooey, I prefer white chocolate frosting, or add butter to make buttercream next time. 1/4 cup coarsely chopped dried figs, save a few slices or halves for decoration. Combine the walnuts, raisins, figs, and sherry in a small bowl and macerate 1/2 hour or longer. In a small saucepan, combine sugar, corn syrup and water bring it to a boil then simmer on medium low heat. Beat egg white in a stand mixer on high speed about 5 minutes or a handheld mixer on high speed about 10 minutes until egg whites reach stiff peak. Check sugar syrup for the soft ball stage by put a drop of hot syrup into cold water then pinch the syrup between your thumb and forefinger. It should form a soft ball like chewed gum. I use this testing over year and never fail. If it is too hard, add a few tablespoon water to hot syrup and start testing again. Temperature for soft ball stage is 235-240 oF. If the egg whites are stiff before the syrup ready, turn the speed to low, do not stop beating. Pour hot syrup in a steady stream between the whisk and the bowl on high speed. Beat the egg whites about 5 minutes. Add vanilla and corn syrup and continue beating for two minutes or until very stiff and fluffy. Filling: Drain the nut/fruit mixture and dry thoroughly with paper toweling. Fold into 1/4 of frosting. Put one layer on a serving plate top side down. Cut 4 4-in strips of wax paper and slide them under the edge of the cake to keep the plate clean. 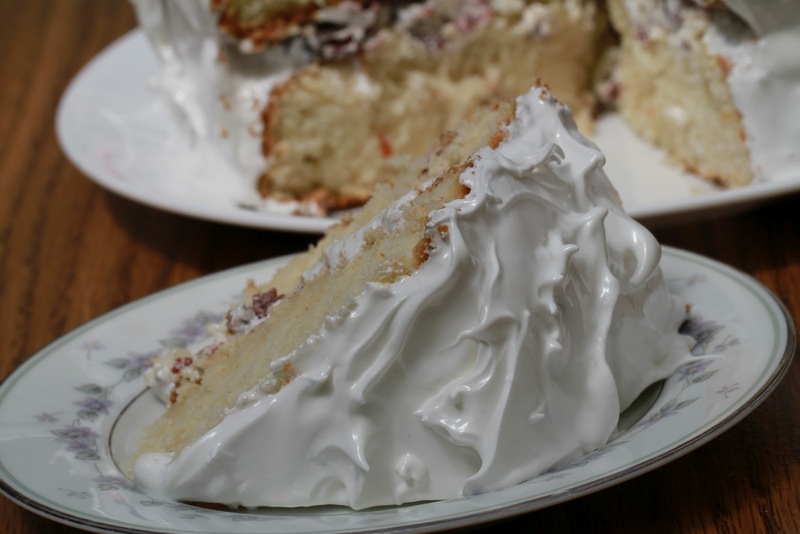 Using the back of the spoon spreading the filling.Place the second layer, to side up, on top of the first, .Cover the sides and top of the cake with the remaining frosting, swirling it on with the back of a tablespoon. Remove the waxed paper strips. Store the cake at room temperature covered with a cake dome slightly ajar to allow air to circulate freely. The cake will keep up to 3 days. *Notes: you may use simple syrup to make the cake moist like in Fraisier cake/ last month post. I still can not make good 7-minute frosting by boiling egg whites mixture over the simmering or boiling water. The result frosting was too soft and too gooey. I did not know what I did wrong but look like the problem has happened to others too. In Great Cake, Mrs. Walter has advised how to fix the running or too soft frosting; in the “Dough Boy” book, there is an easy way to do 7 minutes frosting too. Some authors talked about humidity level’s effect. A Simple White Cake with Pandan leaves and Coconut Filling and Frosting-Banh Bong Lan Trang with Bo va La Dua.